General: Anything but a Chute day. All event flights are on a green flight card. We will draw a green card at random for a pick from the prize pool. 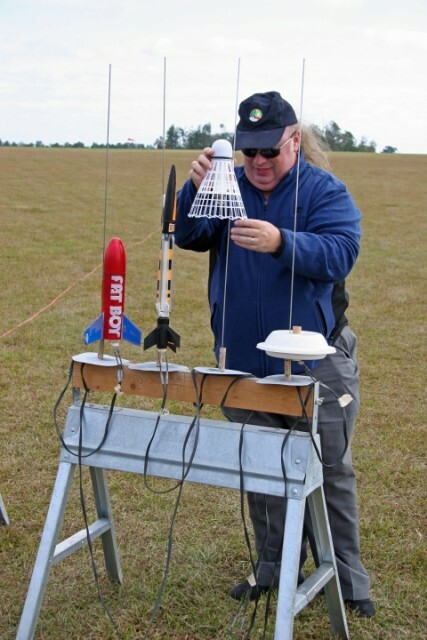 Note Art Applewhite is a good source for many rockets that don’t require chutes including his new monocopter kits. I am going to try out his Helix monocopter. I’ll bring a launch pad for his style of monocopters. Also note Apogee and Fliskits have helicopters. Oh yes any glider would work also. The Edmound Glider Kits are good and available from JonRocket. So you have many options this month. Tom Rackers loading his Big Birdie. Also notice the Estes Skywinder and Hefty Saucer rockets on the pad. Tripoli Central Alabama is hosting a research launch on January 3rd beginning at 9am. This launch is open to all Tripoli members to fly commercial motors, and L2 certified to fly research motors. Please come out and enjoy some homemade motors with us and possibly some catos…. We will collect a $10 range fee for this launch to pay for our renewal. We will also hold prefect elections. Chris’ Rocket supplies will be there to supply commercial stuff for you. We appreciate the use of the field at Greens Grass Farm for our launches. PTS provides excellent service at our launch site in Samson. SEARS fliers enjoy themed launches. But in 2009 were are unleashing a new concept. General, Youth, Challenge and Advanced categories. General will be on the green flight cards and there will be the drawing for a prize pool item. Youth is for fun and will you will likely get your picture on the web site. Challenge is to develop your rocketry skills. Advanced: This categoy is for those who have the basic skills down and have been flying rockets for a year or more with appropriate certifications. These flights will be flown from the wireless launcher if they present a greater risk than normal flights. That would be monocopters, billiard balls, four stage rockets, 7 motor clusters and the like. The stand off distance will be determined by the Club Advisor. Details will be supplied on the next cut. Let me know if you have any tweaks to the events. General: Classic Day: Any published design or kit over 20 years old including clones and upscales. 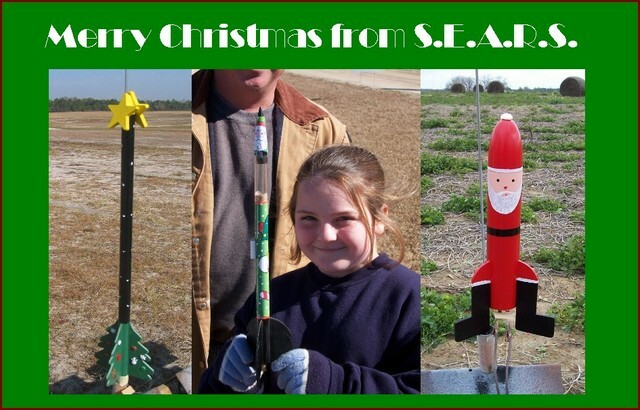 You are currently browsing the SouthEast Alabama Rocketry Society weblog archives for December, 2008.